Throughout 2014 I’m buying a book a month to show support for fellow authors and the retailers who sell our books. Because I hope you’ll buy my books, I decided I needed to get back to buying books and not just secondhand. I’m also doing this to connect kids and families with the best of Christian books. 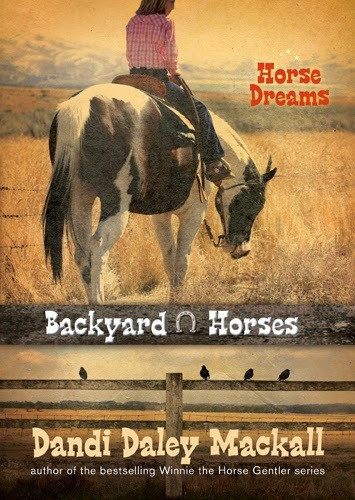 The book I bought for May is Horse Dreams, by Dandi Daley Mackall (Tyndale, 2011), the first book in Dandi’s “Backyard Horses” series of chapter books for young readers. 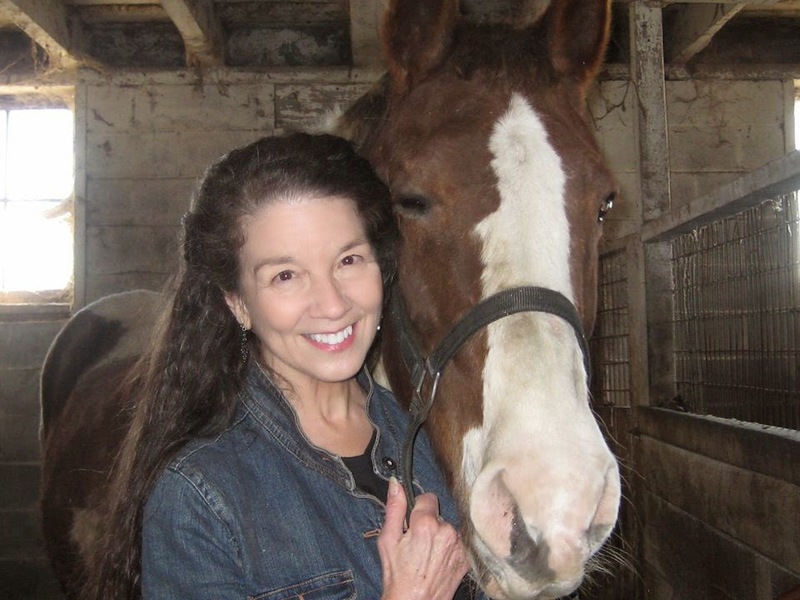 Horse Dreams features a great story, some quirky characters, horses–of course!–and sign language (because the main character’s younger brother is deaf). There’s a glossary called Horse Talk! too. And it’s all wrapped up in some authentic faith lessons the main character, Ellie James, discovers for herself. Fourth-grader Ellie spends a lot of time dreaming about owning a black stallion show horse and winning trophies. She’s decided neither begging nor crying will bring that about and decides to trust God to provide the horse. But will she recognize his answer when it gallops into her life? 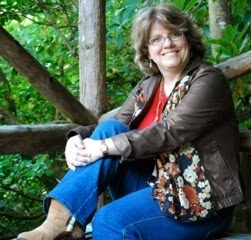 Dandi Daley Mackall is an award-winning author of more than 450 books for children and adults. The text in Horse Dreams is set in a size good for new or younger readers. There are no illustrations, however, which many chapter books do include. Still, the story and characters will pull readers in–and have them asking for next book in the series! Horse Dreams for Kindle is currently free! Not sure how long that will last. Read about the books I bought for January, February, March, and April. But then one woman said, “Yes, me!” and her eyes filled with tears. On this Mother’s Day weekend, I want to tell you about some of the bravest moms I know. They make huge sacrifices, but they never make the news. Their children often get attention, but they themselves are usually overlooked. Their families won’t be getting together for Mother’s Day–except maybe by phone or Skype, if time zones and a good Internet connection coincide. Want to read more? Please join me over at Christian Children’s Authors where I’m honored to share this post today. Throughout 2014 I’m buying a book a month as a show of support for authors and retailers. Partly this is because I am an author and hope people will buy my books. Seems only fair! But I’m also doing this because I desire to connect kids and families with the best of Christian books. 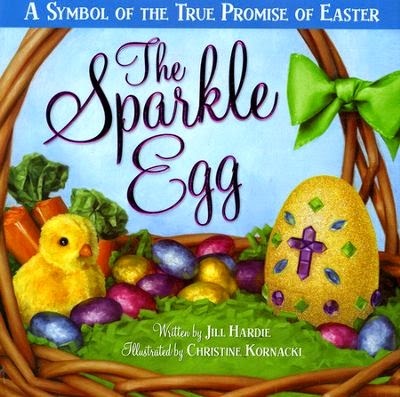 The book I bought for April is The Sparkle Egg, by Jill Hardie, illustrated by Christine Kornacki (Ideals, 2014). Not an Easter book in the sense of telling the biblical story of Easter, The Sparkle Egg helps children understand the Easter message of forgiveness in a concrete way. At the start of the book, Sam has failed a spelling test, and he’s worried about what his parents will say. He forgets about it after school while he’s coloring Easter eggs at home. But when Sam’s mom asks about the test, Sam lies and says he got a gold star. His parents discover the lie the next night at open house. They forgive him, and Sam asks God to forgive him too, but he still feels guilty. Sam is quite surprised on Easter morning when the Sparkle Egg is empty–empty like Jesus’ tomb on Easter morning! Because of Jesus’ death and resurrection, sins can be forgiven and gone. I like the modern yet realistic illustrations in this book and the fact that there is an actual story line to follow–the text is not simply a conversation between Sam and his parents. The final page includes instructions for making and using your own Sparkle Egg. If you read the book with older children, you might want to talk about why Sam lied in the first place, as well as your expectations regarding your child’s success or difficulties with schoolwork. Like Sam, may your child (and maybe even you!) receive a fuller understanding of forgiveness so you can shine a little brighter for Jesus this Easter! Read about the books I bought for January, February, and March. WELCOME to the Catch Us If You CAN Spring Scavenger Hunt! STOP #23. Enjoy meeting Christian Author Network (CAN) members as you chase down clues for the chance to win our grand prize: $200 in gift cards from CBD, Barnes & Noble, or Amazon, plus 30 free books, one from each participating CAN author! Second- and third-place prizes: $50 Amazon, B&N, or CBD gift certificate! Here are the CAN Hunt’s official guidelines. • Catch us on this hunt beginning at Noon on Friday, 03/21/14 and ending at Midnight on Thursday, 03/27/14. No need to hurry as you search for clues—you have almost an entire week! If you need help at any time during the hunt, check in here. • Enjoy 29 stops, each featuring a different CAN author! • Gather the clues from each post, beginning at STOP #1 and ending at STOP #29. At STOP #30, follow the directions and fill out the Rafflecopter form. Be ready to provide the complete clue in sentence form, gathered from all 30 stops, within 2 days of e-mail notification or another winner will be randomly drawn. There is no need to e-mail or submit the clue unless you are notified by 03/29/14. Sorry, due to international regulations and postage costs, prizes will be awarded to US residents only. Individual contests within the hunt may vary, so please read rules presented with each giveaway. My guest at this stop is author, speaker, and “sidewalk theologian” Cheri Cowell. 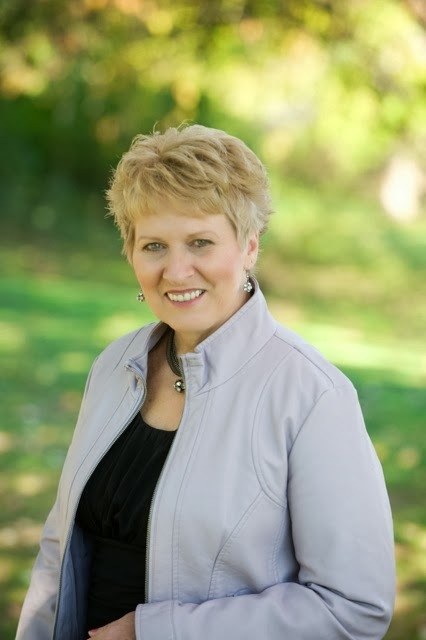 Cheri’s books include Direction: Discernment for the Decisions of Your Life, the Bible study Parables and Word Pictures from the New Testament, and her latest, Living the Story. A graduate of Asbury Theolgical Seminary, Cheri helps others apply biblical principles to everyday life. Besides writing books, Cheri has been published in many magazines and compilations, and in 2009 she was one of six journalists chosen for a 10-day press tour of the Holy Land. Cheri, what’s a sidewalk theologian? I have a degree from Asbury Seminary, but I most enjoy the faith-talk that happens on the sidewalks of life. So … I’m a sidewalk theologian. 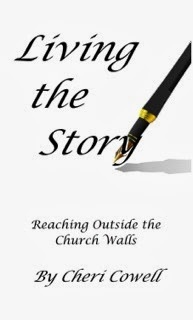 Tell us about your latest book, Living the Story: Reaching Outside the Church Walls. The book, both fiction and nonfiction, is about the cultural and relational differences that make traditional faith sharing ineffective with this current generation, and a solution as ancient as the Scriptures yet fresh as today’s news. In Living the Story, you will meet eight people just like those all of us long to reach with the life-giving message of Christ. You will hear the Story retold as it relates directly to the needs of these eight and, likewise, to those in your life, and you’ll meet six people who speak a new language—the language of story. This isn’t your first book. Tell us about your others. My first book is titled Direction: Discernment for the Decisions of Your Life and relates how I followed all the popular “God’s will ways” right into a messy situation. My Bible study is Parables and Word Pictures, a 13-week workbook-style study. You can check them all out on my website, www.CheriCowell.com. You visited the Holy Land in 2009. What was that experience like? It sounds cliche to say it was life changing, but everyone who goes to the Holy Land has a personal encounter there with God. I’ve written about a few of those events at my blog. One of them happened at the Church of St. Peter’s. When I walked outside the chapel on the Sea of Galilee I could almost smell fish frying … you’ll have to read my blog for the whole story! Cheri would love to friend you on Facebook at www.Facebook.com/chericowell or follow on her on Twitter at www.Twitter.com/chericowell. Thank you, Cheri (and readers and hunters)! CAN hunter, write down this STOP #23 clue: work. Got it? Great! But wait, there’s more! 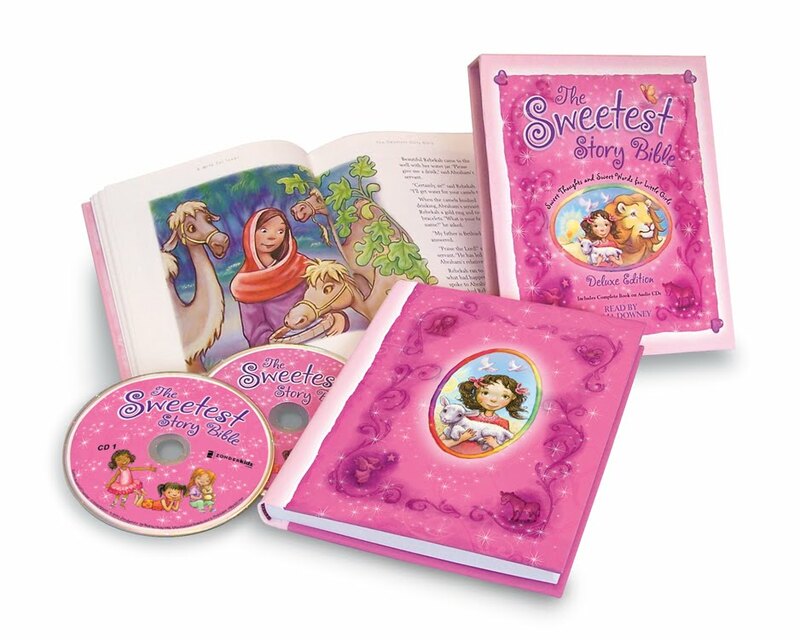 In addition to the fabulous prizes for the winners of the hunt, you also could win a copy of the deluxe edition of my book The Sweetest Story Bible, with a copy of the book plus all the stories narrated by Roma Downey on two audio CDs! To enter my giveaway, just sign up for my newsletter using the box above my photo on this page OR “Like” my Facebook page, Diane Stortz Books. And check out Cheri’s giveaway! Make a comment and leave your e-mail AT THE NEXT STOP, and Cheri will enter your name into a drawing for an e-book of Living the Story. I spotted this book in a TV ad for the Wounded Warriors Project. A little girl was reading it to her military dad, forever changed by the wounds he experienced in war. In the book, a young boy explains why his dad is his superhero–even though he doesn’t have rocket-propelled boots, X-ray vision, or a cloak that makes him invisible. Instead, this dad wears Army boots, night-vision goggles, and camouflage. 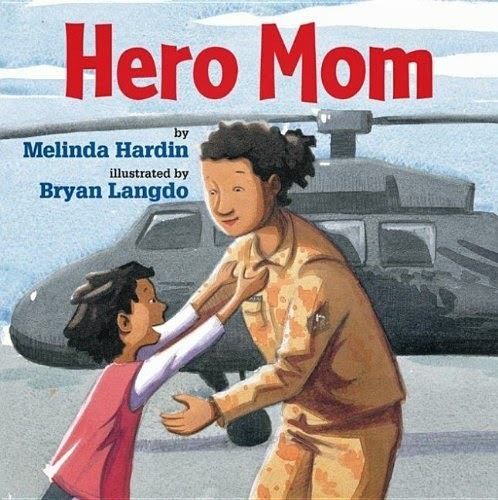 Author Melinda Hardin, working for a US Department of Defense Dependent School in Germany, saw that children can encounter struggles when a parent is in the military. I love the simplicity of the text and art and how well they work together. 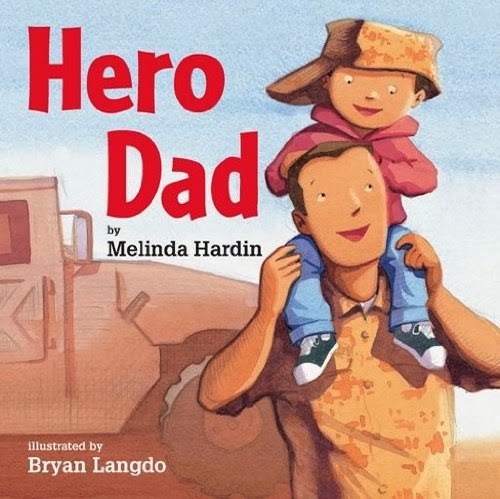 Bryan Langdo’s illustrations help children picture their dads’ work and service and, even more, identifies their emotions while dad is deployed and when he comes home. One spread shows dad and two other soldiers with their rifles, with the right-hand page close in on one of the guns. I’m not sure I like that emphasis, given the gun-craziness around us every day, but if that’s a concern, the spread could be a good jumping-off place for family discussions. Hero Dad doesn’t directly address less concrete reasons military dads are heroes, such as courage, willingness to sacrifice, and patriotism, which older children can begin to appreciate. But for giving younger children a sense of what dad does when he’s away and how happy he is to come home, it’s a winner. Now there’s a companion book about moms too! Last month I introduced my plan and promise to myself to buy a book a month as a show of support for authors and retailers, since I am an author and hope people will buy my books. Seems only fair! I explained that I still plan to visit the public library and Half Price Books and Goodwill for bargains, but … it’s time for me to get back to buying books at regular prices on a regular basis. My first pick was Allia Zobel Nolan’s Whatever. 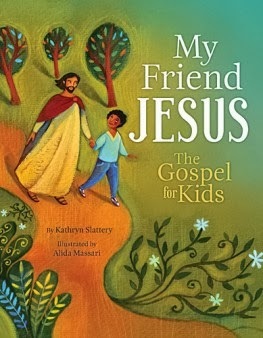 For February, I chose My Friend Jesus: The Gospel for Kids, written by Kathryn Slattery and illustrated by Alida Massari (Tommy Nelson, 2013). It’s a newly illustrated and lightly edited version of a previous edition that sold more than 100,000 copies in multiple languages, according to the publisher’s and author’s websites. Read the book aloud, and you’ll hear the voice of someone with the gift of communicating complex truths to children in simple, understandable ways. We learn about the announcement to Mary, Jesus’ birth, the important things Jesus said and did, and how he showed us what God is like. We learn the very important truth that Jesus loves children. Kathryn covers Jesus’ death and resurrection with sensitivity, and the resurrection with great joy. Then children hear about Jesus’ promises about heaven and the coming of the Holy Spirit to live in the hearts of his followers … his friends. And for readers who want to respond to Jesus and ask him into their hearts, Kathryn provides a childlike prayer. Since the Bible never tells us to ask Jesus “into our hearts,” and because children think so literally throughout their first decade, this is the only potentially negative aspect of the book. But adults reading the book to children might easily substitute other wording. I especially like that children hear the gospel … that the Son of God came to earth from heaven and died for our sins … yet the focus remains on their ability to experience Jesus as a faithful friend today–an appropriate focus while their understanding of their need for a Savior develops as they grow. The beautiful illustrations and book design complement the simplicity of the text while conveying emotions children will be able to identify. Skin tones are realistic for Middle Eastern characters, and the contemporary children in the book include various ethnicities. I’m hoping I get to read this one to my grandchildren! Today I’m happy to host Grace Fox posting about her newest book and the family tradition behind it. Grace is an international speaker at women’s events and the author of seven books, including 10-Minute Time Outs for Moms, 10-Minute Time Outs for You and Your Kids. 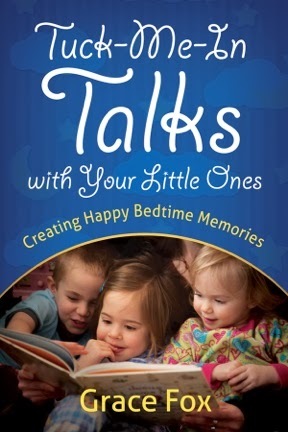 Her latest release is Tuck-Me-In Talks with Your Little Ones: Creating Happy Bedtime Memories (Harvest House). Our five-year-old daughter, Kim, could hardly wait for bedtime. Each evening, she donned pajamas, brushed teeth, and went to the potty without a parental nag or threat. The moment she jumped into bed, she reached under her pillow. Then, wearing a wide grin, she retrieved and opened a zip-locked bag stuffed with little cards. Each card featured one question. “What does it say?” she’d ask, handing the card of her choice to her dad. “With my hands,” Kim answered. She cupped her hands, put them to her mouth, and slurped make-believe noodles. “Why not chopsticks?” asked her dad. “Maybe an ice-cream scoop,” my husband suggested. “No, Silly. Scoops are only for ice-cream,” said Kim. 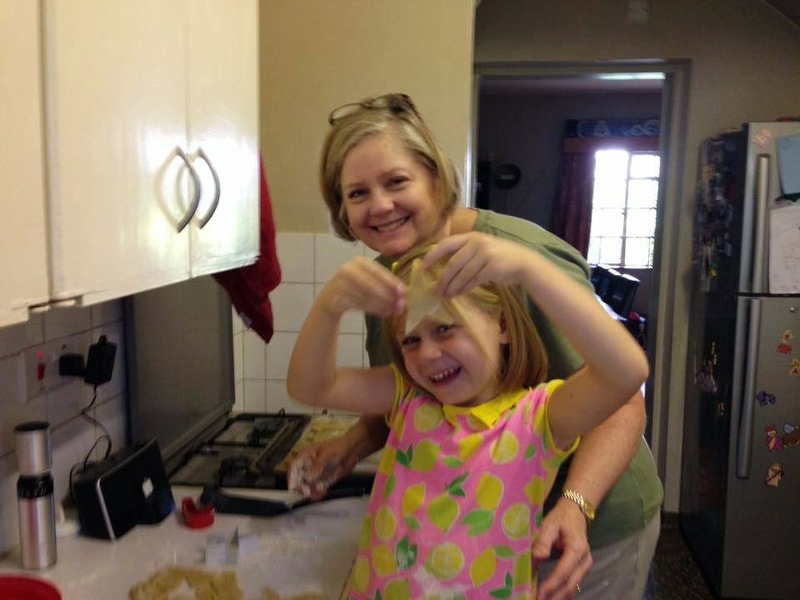 “Ice cream is cold but spaghetti is hot, so a scoop won’t work.” Her dad chuckled at the preschool logic. The banter continued for a several minutes. Finally, convinced a fork was the best option, Kim slipped the card back into the bag and hid it once again under her pillow. Then she crawled under her covers, said her bedtime prayer, and kissed her daddy goodnight. Her dad and I remember it fondly too. We adopted it when Kim’s kindergarten teacher suggested parents ask their youngsters simple questions when tucking them into bed. Doing so would provide a positive end-of-the-day routine, she said. It would also build imagination and language skills and encourage an intentional connection between parents and kids. It sounded like fun, but truth be told, at first we wondered whether it was worth it. Like most parents of young children, we felt exhausted at day’s end. Striking up a conversation with Kim at bedtime seemed counterproductive if we hoped to relax and enjoy a few quiet moments alone. Then again, we longed to connect with our daughter in a meaningful way, so we gave it a try. We discovered that, like any other method of spending intentional time with one’s children, it was a small investment with huge returns. Kim’s cognitive growth proved to be a positive return on our investment, but there were other benefits too. These became more obvious throughout our daughter’s growing-up years. When families eat, play, and build traditions together, says youth and family expert Jim Burns, the result is a strong family identity, which in turn results in the children possessing a strong sense of self-identity. This enables them to develop “a clear starting point for discovering their own place in the world.” Burns also suggests that these children are more likely to embrace their family’s values, and therefore are less likely to engage in promiscuity or drug and alcohol abuse later in life. He adds that children regard a parent’s presence as a sign of care and connectedness. Youngsters whose parents spend quality time with them usually perform better in school and exhibit less negative behavior than those whose moms and dads do otherwise. I’m grateful that my personal experience as a parent reflects Burns’ insights. I believe that connecting with Kim on a regular basis helped establish her self-identity that enabled her to make wise decisions later in life. If I could replay this aspect of her early childhood, I’d make only one change: I’d start this tradition sooner. From three to five, especially, children are all ears and greatly concerned about what their parents think about topics big and small. Today, as a mother of three young adults, I recall those preschool years with joy. Moms with older kids or empty nests told me to enjoy my offspring because they’d be grown and gone before I could blink. Some days I doubted that wisdom, but now I pass along the same advice. The window of wide-eyed openness and opportunity to lay healthy, lasting foundations closes far too soon. The more engaged we are with our youngsters now, the stronger our influence will be. And the stronger our influence is, the less likely culture, media, and peers will sway them later. As parents, it’s our responsibility to encourage our kids’ spiritual, emotional, mental, and physical well-being. The tuck-me-in bedtime tradition proved to be a valuable resource to help accomplish that goal in our family. Give it try. You might find it helpful too! Watch the trailer to Grace’s new book. Grace’s books are available at bookstores nationwide, online, and on her website, www.gracefox.com/books. Read her devotional blog at www.gracefox.com/blog. If I were a child of any other ethnic background than what I am, I know I would get tired of–and be confused by–the people in my books seldom looking like me. 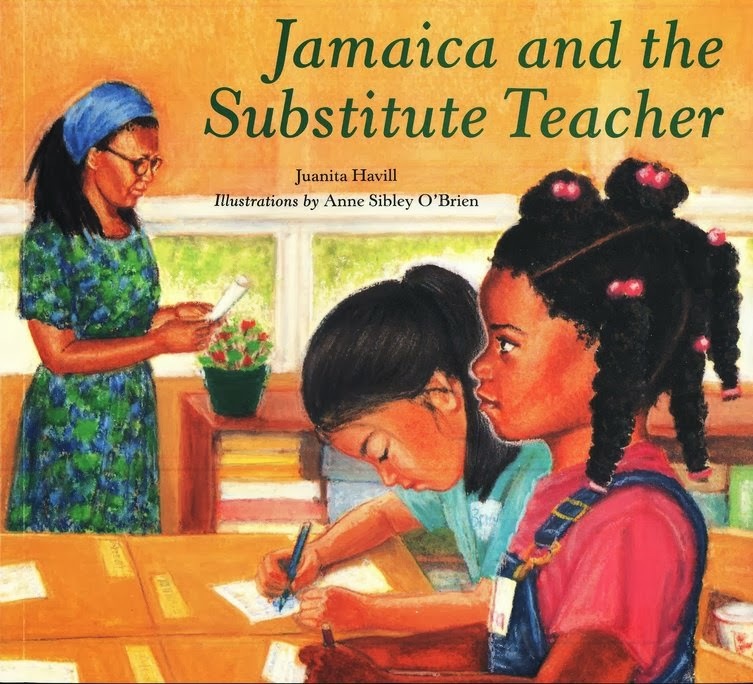 I’m happy to have worked for a publisher that embraced the belief that all children should be able to see themselves in their books and curriculum materials. Often, this meant including children from a variety of ethnicities in group illustrations or photos. Covers tended to show groups or feature a white main character. But not always! 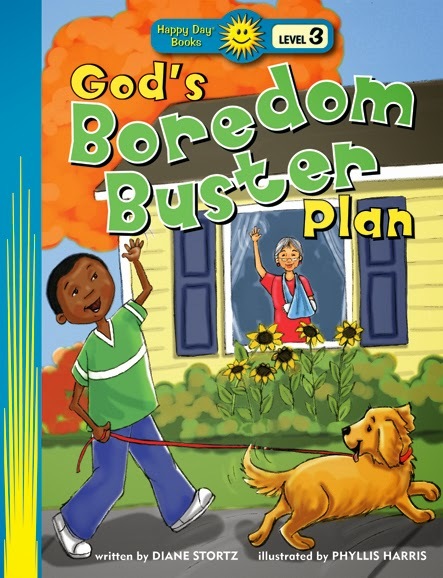 Christianbook.com provides this list of picture books, biographies, and more featuring African-Americans, including several from Christian publishers. You can view and read an excerpt of each book on the list. It’s well worth checking out! 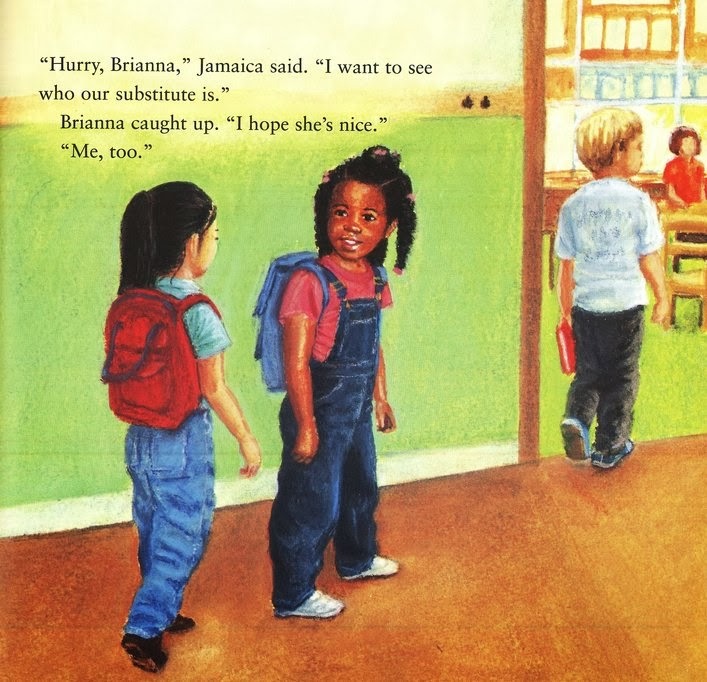 Do you think children from diverse ethnicities are depicted adequately in children’s books? FaithGirlz from Zonderkidz introduced two titles in a new series for preteens in January, and readers are going to have a hard time waiting for the third title, due in June. “The Good News Shoes” series by debut author Jill Osborne features 12-year-old Riley Mae. 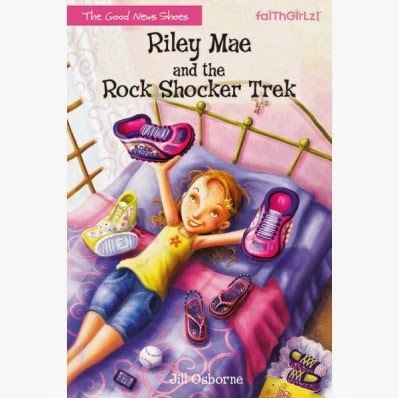 The cover of the first book, Riley Mae and the Rock Shocker Trek, offers up plenty of pink–which Riley loves–but Riley also loves softball, her family and friends, and strong doses of action and adventure. She loves God too, and is learning what it means to walk as his child wearing the “good news shoes” from Ephesians 6:15: “For shoes, put on the peace that comes from the Good News so that you will be fully prepared” (NLT). In Riley Mae and the Rock Shocker Trek, Riley becomes the spokesgirl for the Swiftriver Shoe Company’s new outdoor sport collection. Soon she’s appearing in magazine ads and commercials–and she should be happy, right? But her life’s a lot more complicated now! And something’s not quite right at Swiftriver, which becomes even more evident when Riley laces up her Rock Shocker hiking boots and heads up Half Dome in Yosemite. 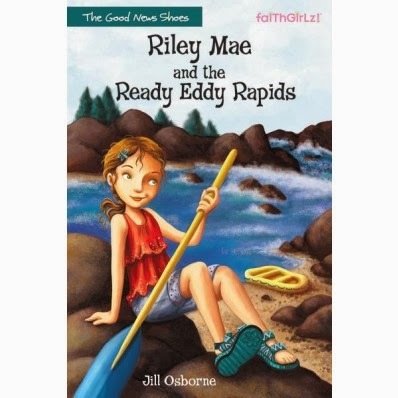 In Riley Mae and the Ready Eddy Rapids, Riley and her family and the Swiftriver team are hiding out for a while, and Riley’s in training for a whitewater photo shoot to spotlight the new Ready Eddy river sandals. With Sunday, a new friend from Kenya who had leukemia, and Rusty, a new friend from home, Riley Mae begins to discover the unpredictability of life and the certainty of faith. And in book three … well, I have a feeling there’s lots more adventure and learning coming Riley Mae’s way soon! So, here’s the truth. I’m an author, and I hope my books sell. In other words, I hope people buy my books. But I almost never buy books myself. I used to. I’ve got a good collection of children’s picture books. I bought a variety of self-help and Christian living titles earlier in life. There’s some meaningful (to me) fiction on my bookshelves too. The people at Crossings liked me. And when I worked for a publisher, I bought lots of books–on an expense account–to keep up with what others in our marketplace were publishing. I loved doing that! But in recent years, when the discretionary dollars in my own wallet shrunk, I stopped buying books. I grew up using the public library, and I started visiting the ones near me more often. Free on Kindle became a draw too, especially if I hadn’t read a particular author before. Books for my grandsons?–Half Price Books and Goodwill! The library, free books on my Kindle, HPB, and Goodwill–still my friends. But I’ve decided I’ll also purchase a book a month throughout 2014 from regular retail sources. Many are likely to be Christian books, purchased from Christian bookstores. I appreciate the support they give to me as an author, and I definitely want to give back! My first pick? 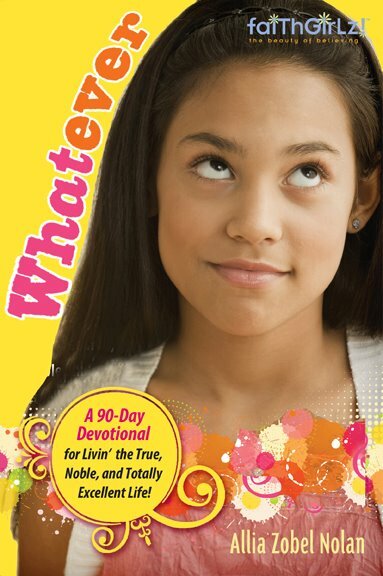 Whatever: A 90-Day Devotional for Livin’ the True, Noble, and Totally Excellent Life by my friend Allia Zobel Nolan (FaithGirlz/Zonderkidz, 2012). Allia guest posted here when the book came out, but until I picked up the book to thumb through it at our local LifeWay store earlier this month, I hadn’t read it. But Allia doesn’t talk down to her tween readers. I think they’ll gladly listen to what she has to say, where she gets her ideas, and why she loves the one who inspires all our true, noble, right, pure, lovely, and admirable thoughts. Allia, I’m glad I handed over my dollars to make Whatever my first “Buy-a-Book-a-Month” pick!